Centre For Alternative Technology01654 705950work Museum - ScienceThe Centre for Alternative Technology (CAT) located in the heart of the Dyfi Biosphere, is a pioneering eco-centre with exciting interactive displays that demonstrate the incredible power of wind, water and sun. It has working examples of sustainable living, environmentally responsible buildings, energy conservation, organic growing and composting. 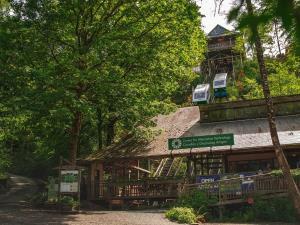 The Centre for Alternative Technology is a great place for children, with an eco-adventure playground and a programme of holiday activities which are both fun and educational. During term-time visitors can enjoy the tranquil surroundings: experiencing the flora and fauna that flourishes around the site, taking a stroll around the fascinating organic gardens or enjoying a leisurely meal in our wholefood restaurant. The CAT Café offers vegetarian menus with vegan and gluten-free options. Our chefs aim to use seasonal produce, much of which is grown on site. Making a trip to CAT is well worth it. Come to the Centre to gain practical tips on sustainable building techniques, gardening, alternative energy sources and land management all while entertaining the kids. CAT works hard to devise positive and practical solutions to the climate change challenge and we believe that giving helpful advice for free on all matters of sustainability will encourage people to make green living a part of their everyday lives. CAT's award winning WISE building is home to a variety of exciting activities that feed into the visitor experience. CAT offers a selection of MSc courses for postgraduates looking to specialise in sustainable industries, and unique short courses in a wide variety of green activities. A wide choice of variety of short residential courses covering a range of sustainability issues are offered including courses on renewable energy, environmentally friendly building techniques, and water and sanitation solutions can help you learn more about sustainable ways of living, and allow you to put your ideas into practice. Check website for details. 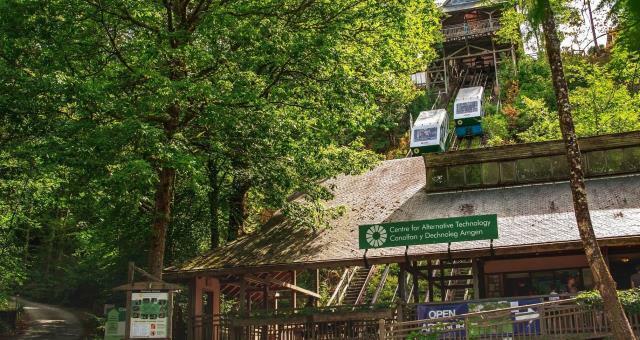 The Centre for Alternative Technology (CAT) located in the heart of the Dyfi Biosphere, is a pioneering eco-centre with exciting interactive displays that demonstrate the incredible power of wind, water and sun. It has working examples of sustainable living, environmentally responsible buildings, energy conservation, organic growing and composting. Access via the water balanced Cliff Railway resumes on Monday 1st April. Open 10am – 5pm daily including Shop and Cafe. Last entry one hour before closing time. The restaurant closes half an hour before the visitor centre.